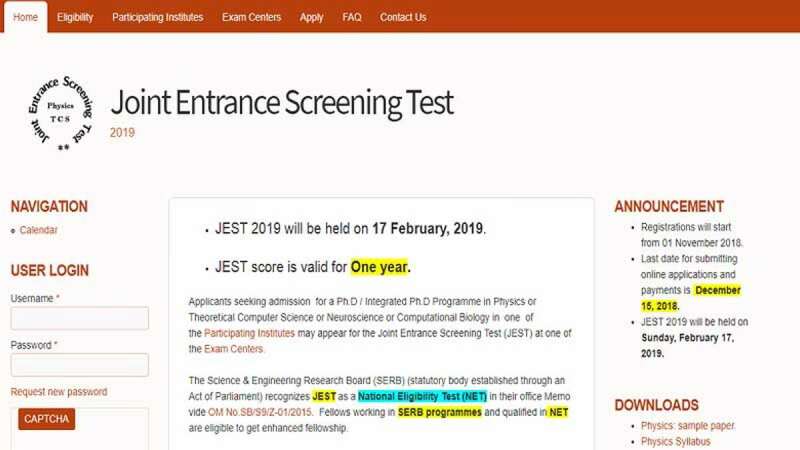 New Delhi : The registration for Joint Entrance Screening Test (JEST) 2019 will begin from November 10 (Saturday). Interested candidates can fill an online application for the exam that has been scheduled for February 19, 2018. Candidates who wish to apply for the examination can visit the official website – jest.org.in – to fill up the application form. Last date to apply for JEST 2019 is December 15. Step 1: Log on to the official website- jest.org.in. Step 2: Click on the link that reads- Registration Form for ‘JEST 2019’. Step 3: Enter all your details and submit. Step 4: Download and take a print out for the same. The candidates who apply for the examination will have to make a payment of Rs 300 (General Category) and Rs 150 (SC/ST/Women). All financial transaction will be done online. JEST is recognised as a national eligibility test by Science and Engineering Research Board (SERB). Different courses have different eligibility and all the details are available on the official website. Those who are willing to appear for JEST should have completed their final year exams by August 2018.